The first leg is to the beautiful Coromandel Peninsula with its amazing beaches. Then on to Waitomo (wai meaning water, Tomo meaning cave) where you will get the chance to see glow-worms, stalactites, cave coral, fossilized oysters and other crazy stuff in the limestone caves formed from 40 million-year-old dead fish. From Waitomo you’ll head to Rotorua, recognized as the Maori cultural, and geothermal capital of New Zealand. You can partake in a traditional feast and marvel at the boiling mud and shooting geysers. Experience the very best of New Zealand with a North Island guided trip. 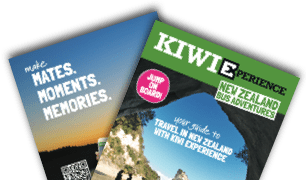 Accommodation not included in these passes however we reserve accommodation for you at every overnight stop for the first night of your stay, with 2 nights in Taupo. Include all your accommodation in one pass! If you’re keen to travel the North Island only and would love the extra benefit of having all of your accommodation sorted before your trip, the Geyserland and Lakes Pass is the one for you, simply add your accommodation pack at the checkout and you’re sorted! Travel to Geyserland (Rotorua) and witness the largest geyser in the Southern hemisphere erupt in front of your eyes or skydive over Great Lake Taupo! Not only does this sweet North Island pass include all the highlights – you can include all your accommodation for a one-off fee. Stay in top-rated hostels, upgrades available for Tamaki Maori Village & Base Hot Rocks (Rotorua). Set and forget!